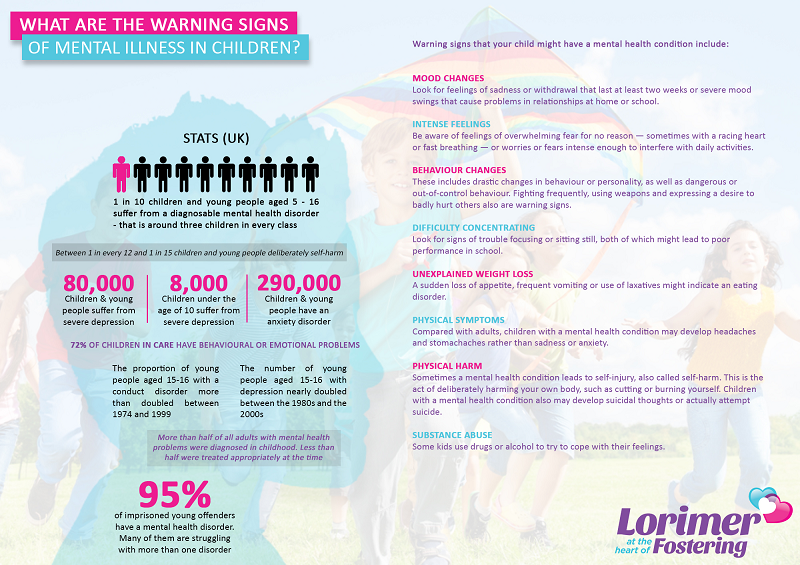 A recent study has revealed that 1 in 10 children, between the ages of 5-16 suffer from a mental health condition. This is a shocking statistic, and equates to around 3 children in every classroom. If this is true, then why aren’t we doing more to help? The truth is that so many of us are unable to differentiate between bad behaviour or young age and potential mental health problems. We need to take it upon ourselves to familiarise ourselves with the conditions and signs and set into motion a support system for those who need us. So many children are being left undiagnosed and untreated, so whether you’re a caregiver, parent, foster parent or teacher, it’s important to be able to help these children out. It’s completely natural for children to push the boundaries and your patience when they are growing up, this is part of the learning process. When you say no, it can often be difficult to process and accept, which leads to acting out, this is completely normal. There is a real difference between learning right and wrong and how to behave correctly, and those who suffer from behavioural problems or other mental illnesses. Acting out can be a learning stage, which is nothing more than a passing phase; whereas if a child continuously acts out and misbehaves, with no real impact when reprimanded, then this is a big red flag. If a child’s behaviour changes drastically, or they seem out of control, then it’s in their best interest to seek advice from a medical professional. Some of the most common symptoms are being aggressive, fighting with other children, and continuously trying to distract people at school. As a parent, it can be equally frustrating to be making no progress and to continually have to deal with a child who misbehaves, but it’s necessary to remain strong and to empathise with how your child is feeling. The signs can often be staring you in the face, but as this is new territory, it can be easy to dismiss them. It’s obviously easier to be able to recognise any sign with your own child, as the way they think, act and behave, is ingrained into you. Whether you’re a teacher, a child minder, or you have decided to foster a child, then it can be less apparent and it’s easier to dismiss the signs. If these symptoms of mental illness seem familiar to you, then you must ask your child about their feelings and behaviour and make them feel safe, understood and that you are there to help. Educate yourself: Make sure that you are fully educated about the warning signs and ways to help people who suffer from mental health before you start to try and educate others. In order for you to be able to correctly communicate with the child’s caregivers or mental health professionals, or even to be able to help and child understand themselves, it’s important for you to be aware of the correct terms to use, what symptoms to look out for, the possible causes and also how to act. Create awareness: By building up awareness of mental health around a school, at a social club, play group or any other place, you reduce the stigma attached to it. This means that students and children will be more likely to open up and come to terms with their feelings. Creating a safe space where feelings and troubles can be discussed, will mean that a child is more likely to open up about a subject. This is also a good way of introducing the symptoms to children so they themselves can become aware of symptoms and even recognise them themselves. Speaking with a child: If you recognise any of the warning signs of mental illness within a child, whether they are your own or one of your students etc. it could be beneficial keep a diary of their symptoms, to ensure that they are. Having a record will allow you to spot any trends, show the reasons that have led you to believe there may be a problem, and that you haven’t just jumped to conclusions. Remember to be positive by reiterating things they’ve achieved and positive qualities before discussing your concerns. It’s also very important not to label them with any terms that could indicate a diagnosis, and instead stick to the symptoms. Speak to someone: You need to take time to stop and think about how this is affecting you. Although the child in question and their family will be going through a stressful time, you are also likely to put a lot of strain on yourself. Rather than concealing your feelings or thoughts it’s a good idea to consult with a healthcare professional, who will be able to help diagnose or rule out any potential conditions.